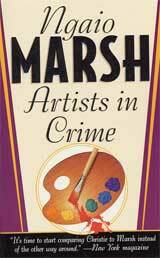 Ngaio Marsh (1895 – 1982) may still be the most famous crime fiction writer from New Zealand. This novel is the sixth in the Alleyn series, and the story where he meets Agatha Troy, the brilliant painter, whom he marries later. This may not be art crime, but certainly artist crime. Alleyn falls for the interesting artist at first sight; she misunderstands him and feels annoyed by his unwanted attention while he, the nobleman, sees her beauty, her talent, her personality and her great intelligence behind the coat of paint. Agatha Troy is going back home to Britain to begin a painting class for a handful of promising painters. As the reader expects, a murder soon takes place in the small, closed circle, and of course Alleyn is on the case, giving him a chance to be close to her. There are several points of resemblance between this fine Golden Age whodunit and Dorothy L. Sayers´ Strong Poison, the novel where Lord Peter Wimsey meets Harriet Vane, the interesting and intelligent author who is accused of murder. Wimsey falls in love at their first meeting and does everything to save his beloved, but she is far too proud to accept his proposal. Coming up later this weekend: Competition – win a gift card. This entry was posted in 2010 Challenge, New Zealand, Ngaio Marsh, review. Bookmark the permalink.